Former White House chief strategist Steve Bannon arrives for an interview by the House Intelligence Committee investigating alleged Russian interference in the 2016 U.S. election on Capitol Hill, in Washington, Jan. 16, 2018. Former White House chief strategist Steve Bannon has agreed to meet and cooperate with special counsel Robert Mueller in his criminal probe of Russian meddling in the 2016 U.S. presidential election. U.S. media say no date has been set for his interview with Bannon. But his deal with the prosecutor came after news surfaced Tuesday that Mueller subpoenaed Bannon last week to testify before a grand jury probing the Russian interference. Bannon could be a key figure in Mueller's investigation into whether Donald Trump's campaign colluded with Russian interests to help him win the White House. Bannon could offer investigators inside-the-White-House information whether Trump obstructed justice by firing FBI Director James Comey while Comey headed the agency's Russia probe before Mueller took over the investigation. Bannon oversaw the last few months of Trump's successful run for the presidency and worked in the White House for seven months before being ousted in August. 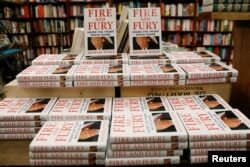 He continues to support Trump's brand of America-first populism, But his relations with Trump fell apart earlier this month after Bannon was quoted extensively with critical remarks about the campaign and White House operations in author Michael Wolff's new book, Fire and Fury: Inside the Trump White House. ​The former Trump adviser was quoted as calling it “treasonous” and “unpatriotic” that Trump's eldest son, Donald Trump Jr., son-in-law Jared Kushner, now a White House adviser, and then-campaign manager Paul Manafort met with a Russian lawyer in the midst of the campaign in an effort to get “incriminating” evidence against Democratic presidential candidate Hillary Clinton. Bannon's agreement with Mueller came after a rocky, hours-long appearance Tuesday before the House Intelligence Committee, one of three congressional panels conducting Russia probes in which Bannon refused to answer questions. White House Chief of Staff John Kelly refutes reports the White House told Bannon's lawyer that Bannon must keep silent during Tuesday's appearance before the House. “Steve has had very very little contact with the White House since he left,” Kelly told Fox News Wednesday night. FILE - A combination photo of Donald Trump Jr. from July 11, 2017, Jared Kushner from June 6, 2017 and Paul Manafort from Aug. 17, 2016. After the book was published, Trump started calling Bannon “Sloppy Steve” and said, “Steve Bannon has nothing to do with me or my presidency. When he was fired, he not only lost his job, he lost his mind.” Bannon also was removed last week as the top executive at Breitbart News, the alt-right news site that has championed Trump's policies. Trump has repeatedly said there was “no collusion” between his campaign and Russia, although none of the months-long congressional investigations or Mueller has reached any conclusions.